In February this year, my inner child got her heart’s desire fulfilled when I purchased a super cute munchkin kitten, called Maha Munch. I live next door to a lovely family who have a gorgeous Maltise dog called Honey. When Honey first met Munch she was initially scared and I was told by her owners that she wasn’t the biggest fan of cats at all. Honey is very social and likes to visit me. 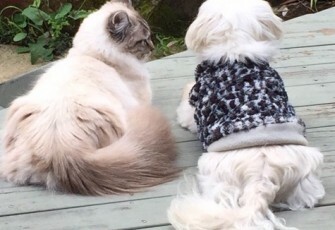 When she came over she would bark at Munch and he would puff up his fur, then run away and hide. This was occurring on a daily basis. I found it quite stressful and Honey was very vocal in her dislike of my kitty Kat. I did a healing on Munch trying to help him assert himself and his territory, but this didn’t seem to work. So I did a Shanti Mission style IYS (Ignite Your Spirit) relationship healing on Munch and Honey. And how amazing it was! What stood out to me the most in the healing was the karma in the base chakra of their relationship regarding the relationship between cats and dogs. The healing took about 15 minutes and as soon as I sealed and cut from the healing, they were playing together. The change was literally instant! Since then they have been the best of friends and Honey very generously lets Munch stay with her family when I go away. Thank God for IYS Therapy.